The Kilnhurst Pottery, midway between Doncaster and Sheffield in South Yorkshire operated from 1746 to 1929. For most of that time it made household items of transfer printed earthenware and creamware almost indistinguishable from other contemporary Yorkshire potteries such as Swinton (Rockingham) and Don. The connection with "Brownjugs" comes in the late 19th century when it started making what were known as Bristol Wares. These were jugs and tankards moulded in very low relief primarily for the pub trade. Production was very high and continued until the introduction of handled glass tankards made them uneconomical. A fairly small percentage were officially marked by local standards officers with the "uniform verification mark"
The uniform verification mark was introduced in 1879 and can be decoded by clicking on this link. Click Here. Click button below for images of location marked examples in my collection. Oxley Grabham's Yorkshire Potteries, Pots & Potters, 1916, reprinted 1971 states "Mr Bowman Heald introduced" (1884) "what is termed the 'Bristol Ware' made in various sizes of mugs and jug, such as are used in the Eastern counties and the South of England and in London. These goods were formerly made at one of the Bristol Potteries (since discontinued) exclusively, hence its name1. Gradually Kilnhurst secured almost the whole trade in this particular line and is now practically the only maker of these goods. .... Within the twenty-three years from 1884 to 1907 over one million Bristol mugs and jugs were sold." 1. 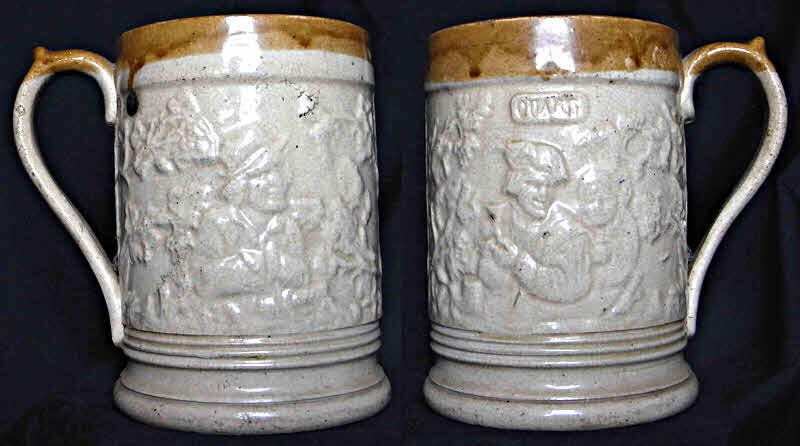 This marked quart tankard confirms that the Bristol maker was John Ellis, probably at The Crown Pottery. John Ellis is recorded in trade directories at various Bristol potteries from 1848, but was at the Crown Pottery from approximately 1872 until 1880. The Crown Pottery continued to operate until at least 1904. Information from Bristol Potters 1775-1906, R.K. Henrywood, Redcliffe Press, 1992. PS Kilnhurst is also notable as the birthplace of Charles Sargeant Jagger (1885-1934) the sculptor of many impressive World War I memorials.